Powergoals are lightweight, truly portable soccer pratice goals, available in a variety of sizes from 4' x 8' to 8' x 24', weighing between 10 and 18 pounds. 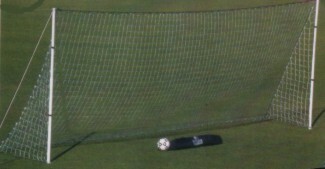 Each goal comes complete with a nylon carrying bad and a high quality net. All models can be set up by one person in a matter of minutes.